It was only a matter of time before Days of Wonder started adding expansions for Small World, as it screams for them! Grand Dames is the first of what promises to be quite a few in years to come. You only get two White Ladies, but don’t let that fool you. During decline, they are indestructible. Yes! Girl Power! The Gypsies gain VP by moving around the board. You place a VP from the bank on regions you abandon. At the end of the turn you score normally plus you get each of the VP coins you placed on abandoned regions. Priestesses ability activate in decline. You pile her leftover tokens in a region she was already in to create the Ivory Tower. You then score a point for each token in the Ivory Tower every turn. Gets points for declining races. Gets points for not attacking active races… but, still attacking declining ones. After using this expansion in a few games, I think it is a nice addition. I especially enjoy the White Priestesses. The best part about Small World is the variety of characters and powers, so adding expansions is a no-brainer if you love the game like the rest of my family does. Adding female characters created by fans was a brilliant move by DoW, because there was a dearth of ladies for all the wives and daughters of the World. Good move. 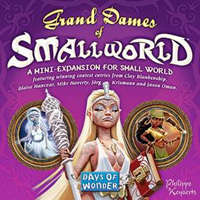 Add a Review for "Small World: Grand Dames"